Home / Figure Skating News / Chan’s back! Patrick Chan performs his Short Program at the 2016 Canadian National Figure Skating Championships. Mack is Back. Finally. After a season of flubbed short programs, Patrick Chan performed his Michael Buble routine foot perfect featuring a quadruple toe loop-triple toe loop, triple Axel and triple Lutz, scoring a whopping 103.58 points. “After I landed the Axel, the two hardest jumps, quad and axel, I can kind of start relaxing a little more and enjoying it a bit more and also mixing back into ‘Okay, I gotta think about the usual things I think about going into Lutz so that’s successful and once that’s done I gotta think about the spins.’ It’s juggling,” said the 2014 Olympic silver medalist. Particularly satisfying was that the performance followed a shaky warm up. Chan was also sporting a costume change: a bright purple sweater vest in place of the mauve V-neck sweater he used earlier in the season. The costume switch was his coach’s decision. 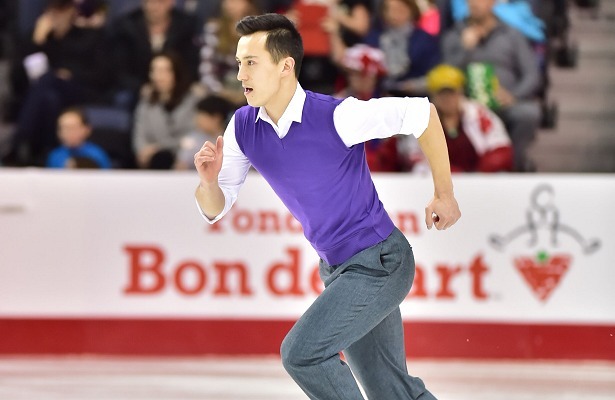 The men’s event was intended to be a match up between Chan and the reigning national champion, Nam Nguyen of Toronto, who snatched the title in Chan’s absence and then placed fifth at the 2015 World Figure Skating Championships. However, the pressure of being defending champion weighed on Nguyen and the 17-year-old fell on his opening quadruple toe combination and placed fifth with a score of 76.04. In second place, Liam Firus also struggled on his jumps with botched landings throughout, however he managed the best component scores next to Chan for a total score of 78.87. Nerves were creeping into his mind all day. In third place, Kevin Reynolds scored 77.65. In his lively routine to “Tank” by Yoko Kanno, the British Columbia skater narrowly landed a quadruple Salchow-triple toe loop and triple flip, but fell on the triple Axel. Keegan Messing is in fourth place with 77.20.